Town and district in the government of Minsk, Russia; situated on a peninsula on the left bank of the Beresina, about fifty miles from the capital. 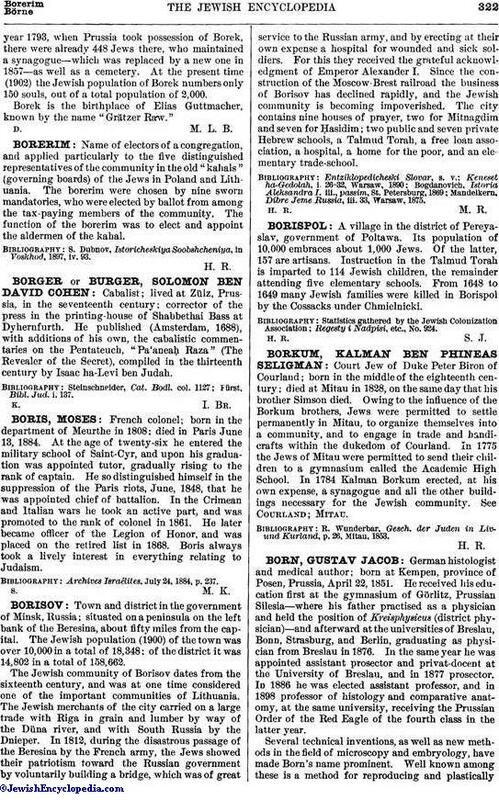 The Jewish population (1900) of the town was over 10,000 in a total of 18,348; of the district it was 14,802 in a total of 158,662. The Jewish community of Borisov dates from the sixteenth century, and was at one time considered one of the important communities of Lithuania. The Jewish merchants of the city carried on a large trade with Riga in grain and lumber by way of the Düna river, and with South Russia by the Dnieper. In 1812, during the disastrous passage of the Beresina by the French army, the Jews showed their patriotism toward the Russian government by voluntarily building a bridge, which was of great service to the Russian army, and by erecting at their own expense a hospital for wounded and sick soldiers. For this they received the grateful acknowledgment of Emperor Alexander I. Since the construction of the Moscow-Brest railroad the business of Borisov has declined rapidly, and the Jewish community is becoming impoverished. The city contains nine houses of prayer, two for Mitnagdim and seven for Ḥasidim; two public and seven private Hebrew schools, a Talmud Torah, a free loan association, a hospital, a home for the poor, and an elementary trade-school. Mandelkern, Dibre. Jeme Russia, iii. 33, Warsaw, 1875.